It's that time of year again! School is back, the Houston Texans are getting ready for the Super Bowl, and there are only 3 weeks left until #INBOUND14. Where has summer gone!? In case you're new to our blog, or you're living under a rock, #INBOUND14 is HubSpot's yearly conference extravaganza. 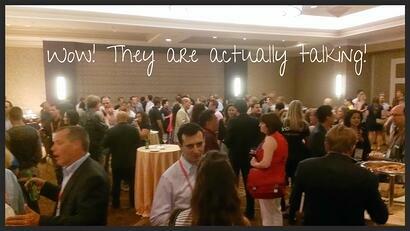 Held in Boston every year, it's the go-to-place for inbound marketers young and old. With keynote speakers, workshops, even concerts and happy hours, there's something for everyone. At LyntonWeb we look forward to attending every year. We take time to learn about what speakers will be attending, and what product features are being released. Whether we are hosting a booth or not, we get excited to see our clients, meet new people, and gain more knowledge about the ever changing world of inbound marketing. I mean actually speaking to another human being. Not texting, not emailing, actually conversing with others. Say hello to the person next to you at a workshop. Strike up a conversation when waiting for a beer. You never know who you might meet, what you could have in common, and how they could help your business. Use this time to actually engage with others, and interact with people face to face. I challenge you to actually put down your smartphone and talk to the person next to you. It will be difficult, and your Facebook followers may worry when they haven't received a status update in an hour, but I believe in you. If you're brand new to inbound marketing and attending the basic workshops, don't be afraid to ask questions afterwards! The speaker will likely be too busy to talk day of, but don't be afraid to ask for their business card or email address. Then you can ask follow-up questions that way. If you're a HubSpot agency and meeting potential clients, use this time to talk to prospects and get to know their business in more detail. You don't always have the opportunity to talk with potential clients face to face. So this is a great time to really understand any difficulties they may be facing in more detail (without having to send 20 emails back and forth)! Don't be afraid to be silly! 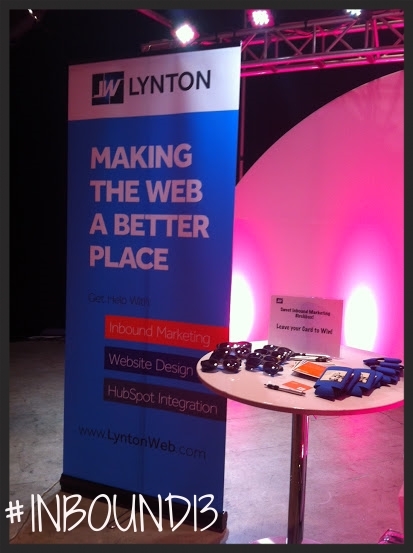 At Inbound last year, LyntonWeb walked around in blue converse, football jerseys, and matching t-shirts. 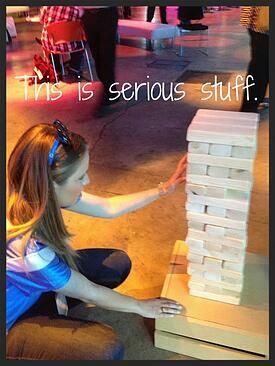 We handed out koozies with mildly suggestive jokes, and we played giant jenga. We figured if we were having fun at our booth, then other people we just be drawn to all the fun we were having. If you're an agency representing yourself at Inbound, get creative. Think of ways to draw attention and get your name out there. Whether that's playing games, dressing alike, or promoting a giveaway, don't be afraid to be a little silly. After all, it's not a crime to have a little fun every now and then! Continue your relationships after Inbound. So you put down the smartphone and you met new people. Congrats! It would be a waste to not continue those relationships afterwards. Yes, it's a lot easier when you're face to face, but don't let that relationship dwindle after you leave Boston. 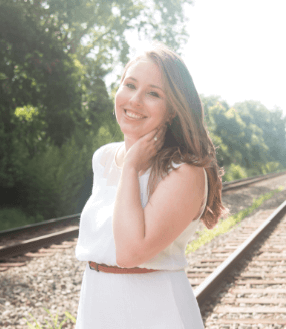 Last year LyntonWeb had one of our largest website redesigns from a prospect we met at Inbound, because we nurtured that relationship after we got back to good old Texas. You use the same principles whether it's someone you're adding to LinkedIn, sending them a blog post, or sending a quick "nice to meet you" email. I'm so excited for #INBOUND14 and I'm sure it will be HubSpot's best conference yet. Do you have any other tips for making the most out of the conference this year? I'd love to hear them!